It Works! Review. Types of Products, How it works, Pros and cons. It Works! offers an array of products that promise to aid in weight loss, detoxify, cleanse the body, tighten and improve skin appearance. 1. What is It Works!? 8. Do It Works! Products Work? Lack of diet recommendations which is a significant health concern. But, before you brush it off, read this detailed review and learn more about the company and the products offered. It Works! is an MLM company that produces a range of products like probiotic supplements, skin care products, and green drinks. Furthermore, some of the products tones and tightens the skin and boost physical performance. It is ideal for repairing body appearance as well as tone the skin. It tightens, tones, and firms the skin. This gel softness, hydrates, and improves skin texture. The product contains peptides and proteins that boost skin appearance and reduces wrinkles temporarily. It is a cream-infused deep hydration sheet mask that softens the skin. An alcohol-free mist for toning and moisturizing the skin. It is a soap-free gel that gently removes oil, cleanses makeup, and moisturizes the skin. The product comes into two versions– night and daytime creams. They contain botanicals to softens your skin appearance and protects against sun exposure. It is a non-greasy body cream that promotes skin’s elasticity and firmness. It is great for hair, nails, and skin. It boosts natural collagen and keratin production and promotes cell growth. The cream is ideal for people with dry lips and sensitive skin. It will help remove dead skin and excess oil. They help to balance enzyme and maintains a neutral pH. The blends are available in various flavors chocolate, oranges, berry. It Works! Global has a full line of health and beauty products including: body wraps, thermogenic diet pills, and cleanse supplements. The Company Offers shakes, probiotics, formulas, minerals and omega-3 supplements that promote body functions. These products help to fuel your ketogenic lifestyle. You will get lavender, Tea Tree, Lemon, Eucalyptus, and coconut oils– are ideal for the skin and body. It Works!, a privately held company, is a direct sales empire that focuses on body contouring, personal care products, and healthy foods, with its main product being Ultimate body applicator or body wraps. Mark Pentecost and his wife Cindy started the Company in 2001, launching their first product the Ultimate Body Applicator. And, in 2005, they launched their premium supplements product line. It Works! has their headquarters in Florida. But, Mark seeks to open offices in other countries too. The It Works! body wraps will eliminate excess fluids from your stomach, and leave you looking lean. It Works! products are sold in the United States, although they are gaining popularity in the United Kingdom, Australia, and Europe. Its official website is www.myitworks.com, and contact number is 1-800-537-2395 or 952-540-5699. Better Business Bureau has rated It Works! at C+. BBB has a customer alert for It Works! on their website which indicates an increase in the number of complaints from customers who wish to end their service. Furthermore, some customers have expressed concern about the shipping process–they have received wrong products countless times. BBB It Works! Customer alert. The selling point of It Works! is their vast product line that claims to offer health benefits depending on the product used. These products contain a combination of ingredients like botanicals, natural herbs, and vitamins that increase energy, clears, and tones your skin. Green Tea is used in its concentrated form and is a great alternative to coffee. The extract contains Catechins– antioxidants that boost immune function, cardiovascular health, promotes weight loss and lowers cholesterol levels. BHB is a compound that is synthesized by the liver and is used as an energy source for the brain when the blood glucose is too low. BHB also elevates ketone levels in the body. Probiotics are microorganisms found in the gut flora that promote digestive health, relieve gas, bloating, constipation, diarrhea, and also boosts immunity. N/B. You can also get the microorganism from yogurt, kefir or probiotics supplements. It is a seaweed, which is used in its dried form or supplements. Spirulina contains 24% carbohydrates, 8% fat, 60% protein and 5% water. It is also rich in B vitamins–Thiamin, and riboflavin, Iron, Manganese, Zinc, Selenium, and Amino acids. Spirulina is an incredible food supplement but can cause adverse effects if taken with immunosuppressants or anticoagulants. Dandelion is a herb that is believed to reverse stomach upset, appetite loss, intestinal gas, gallstones, muscle aches, and joint pain. The root also works as a laxative, increases bowel movement and promotes urine production. Amino acids are proteins building block, and they help to break down food, repair body cells and tissues. The compounds are grouped into essential, non-essential, and conditional amino acids. They are used in foods, cosmetics, fragrances, soap and skin care. Plant proteins help with appetite suppression and building muscles. Weight loss. It Works! has specific products– ThermoFight and Metabolic Burn that contain green tea extract, caffeine, and chromium. These ingredients have shown positive results in fat loss and weight reduction. According to a report published in the Journal of Diabetes Technology and Therapeutic, Chromium has shown a promising result in curbing hunger and cravings. It Works! has various products; let’s look at some of them. Expect ultimate results in as little as 45 minutes with the Ultimate Body Applicator! 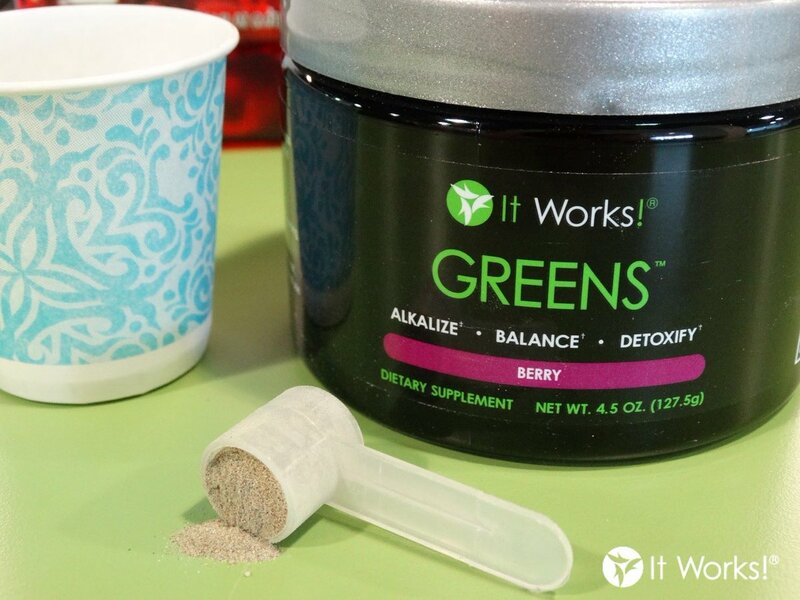 The Green drinks and supplements contain 52 herbs and superfoods like fruits and vegetables. Some of the ingredients include spirulina, lemongrass, and green tea extract. The Company claims that two scoops of Green powder are equal to the recommended eight servings of fruits and vegetables. But, when we compared it to other basic green smoothies, the Green Drinks fall short. It Works! 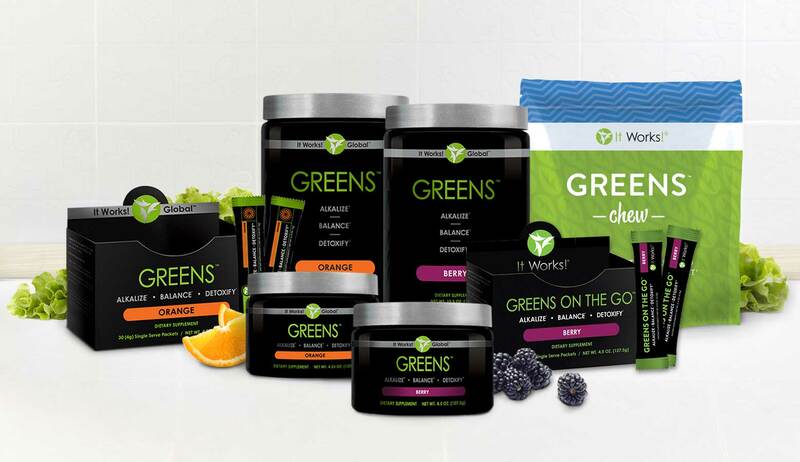 encourages its users to continue taking greens in addition to the supplements. So, what’s the point of the green supplements? The Wraps claim to promote firmness, tightness and skin toning. It Works! recommends using the wrap for 45 minutes or wear it overnight for excellent results. So, how does the wrap work? The Wraps contain active ingredients that hydrate the skin and define your body’s contours. Unlike the Green Drinks, It Works! Wraps have received a tone of bad reviews, with most customers reporting lack of results. Moreover, It Works! does not explain the mechanism behind the wraps. Even though the wraps may aid in weight loss, it is vital to change your diet and exercise regularly for long-term results. Cleanse is a two-day plan that promises to reset and rebalance your body. The company has two types of these detox drinks: Herbal cleanse and Proprietary Nutrition Cleanse Blend. Herbal cleanse contains Blue Agave Extract and Aloe vera leaf gel that nourishes your microflora and promotes cellular health. Similarly, Proprietary Nutrition Cleanse Blend contains 25 foods and botanical extracts that support the body’s detoxification process. Additionally, it provides the body with the necessary nutrients– vitamins, minerals, enzymes, and fiber. According to It Works! these cleanse drinks work best if used with their other health products. This is an intensive gel that hydrates and firms the abdomen, arms and thighs. The gel works best if combined with the Ultimate Body Applicator. The side effects will depend on the product used but can include allergies, constipation, abdominal cramps, and dizziness. At the moment, no reviews are posted on the Company’s Website. However, you can find more information from Amazon and other online distributing websites. It Works! supplements can be bought from the Official website or Amazon. Expect to part with between $5 and $179 depending on the product. Before you become an It Works! distributor, ensure you get all the information relating to the process. As a distributor or a Wrapreneuer, you will pay $99 startup fee for the starter kit. The kit includes training tools, sample wraps, defining gel, ultimate body applicator, bracelet and business tools. Loyal customer commission. By buying regularly, you will get an income as long as you continue as a loyal customer. Team commission. As a distributor, you can earn up to 10% commission based on the number of people in your team. It is an 8-week program that promises to give nutritional support and mental clarity. Read the detailed Thrive Patch review. Plexus slim is a weight loss supplement drink manufactured by Plexus Worldwide. Read full review. Herbalife is an MLM company which manufactures multivitamins, dietary supplements, protein shakes, Energy drinks, and nutritional shakes. Read the detailed review. It Works! Has some great ingredients like green tea extracts, dandelion, and spirulina. However, some of the products have additives that can be harmful to your body functions. Moreover, the diet plan has significant flaws like the green drink does not list the caffeine content. Furthermore, the Wraps have not proven to aid in long-term weight loss results. That being said, we wouldn’t recommend It Works!. But, if you still want to try out It Works! diet plan, visit their Official website for more information. Alternatively, you can use Amazon to buy the various products.